I know it�s frustrating for iPad and iPhone users to have AirPrint on their device but not be able to use it. While some people may have a printer that supports AirPrint many do not. 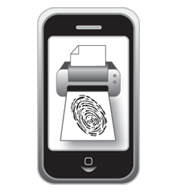 That leaves us with third party solutions to allow people to utilize the printing feature on iOS devices. Not long after Apple released the AirPrint feature, developers starred coming up with software or tweaks that would allow AirPlay to work on printers that does not support AirPlay. The options have been some what limited, especially for Windows users. It does not require you to jailbreak your iPad, in fact you don�t need to install anything on your iPad. The software is compatible with both Windows and Mac. FingerPrint for Max OS X is $7.99 and FingerPrint for Windows is $9.99, they both have a free trial. While it�s not a free solution, there are some advantages over AirPrint Installer. First, the set up is a breeze. After you download the software, it�s a typical Windows setup where the install wizard guides you through the installation. It took me less than 5 minutes to download and install the software. After the installation was complete my printers showed up when I selected to print using AirPrint on my iPad. I would call the setup pretty much seamless. Another advantage over AirPrint Installer is the �Open on My PC� feature. When you select this option as a printer, instead of printing the document it just opens it on your PC.